After being picked up at your hotel or other designated site*, your tour begins in San Ysidro, home of the world’s busiest land border. In the comfort of an air-conditioned van driven by your experienced guide, visit the gauntlet of fences, ravines, and washes where hundreds of thousands of migrants cross into the United States. Witness the beginnings of the billion-dollar fence project, our elected officials’ latest attempt to dissuade undocumented migrants. Continue west up and down rolling hills (weather and other conditions permitting). 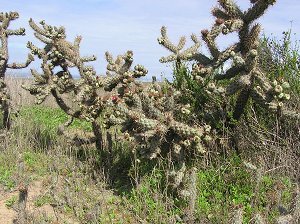 Take in Southern California’s unique chaparral ecosystem, here laced with trails carved by generations of migrants and dirt roadways where Border Patrol Agents do their best to secure our border. Enjoy excellent vistas of the Pacific Ocean. With luck a wild roadrunner will dart by, and a hawk or a turkey vulture will sail overhead as you head to the beach and Border Field State Park. Have your picture taken by the marker delineating the territories of the United States and Mexico. Gaze at the Pacific Ocean as you take a quick walk in the sandy beach. End your unique border adventure with a snack at El Tapatío, a family-run Mexican restaurant in Imperial Beach.